Not wanting to go for the simple (but in hindsight, very effective) direct-drive for a ball, we opted to create a ‘Mechanical Hamster’ and put it inside the transparent ball. This involved using two ‘omni wheels‘- one to power forwards and one to steer left or right. The rolling mechanism needed to be weighted to give it a low centre of gravity. The two haves of the ball were made from PC for the rigid inside (rolling skin) and PET for the durable outside – seamlessly joined with recessed screw mounts and the surface was coated with a silicone rubber for grip. A small LED was placed at the ‘front’ so we could see which way the ‘hamster’ was facing. Fueled through the late nights by pizza and caffeine, we just managed to get all the belt drives to work and it sprung to life! 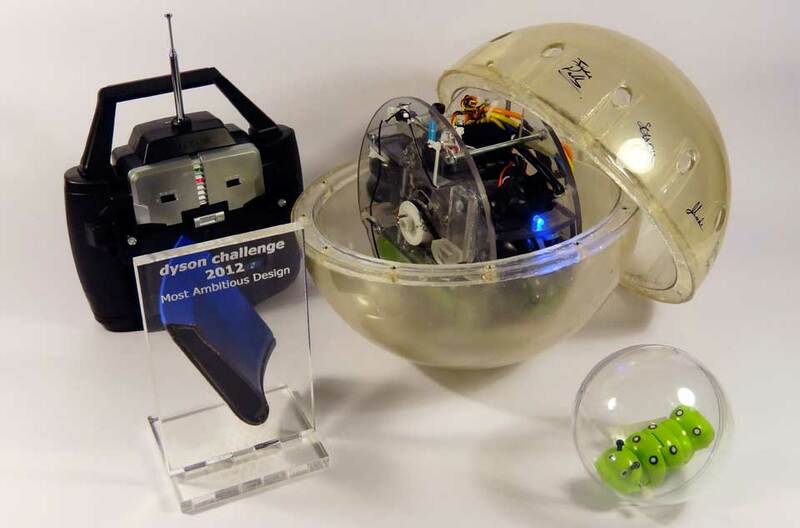 Clearly there were more reliable ways to make a remote controlled ball, but it was great that the concept and fabrication were acknowledged for pushing the brief and as a team we really felt we’d gone way beyond what we though was possible in the time using old vacuum cleaner parts!